Remember this? Good. If not, a quick recap: the official Nintendo magazine of the United Kingdom had a chance to play Spirit Tracks a few weeks ago. One of the bros who got to play it is Fred Button. Being the swell guy that ol’ Freddy is, he gave us the chance to ask just about whatever questions we had regarding Link’s upcoming adventure. And today, they were answered. Naturally, all the good stuff has been saved for their review of the game, but we’ll see all that when the new issue goes on sale this Friday anyway. Head inside to see how Spirit Tracks relates to other Zelda titles, when Princess Zelda is playable, if this is the best handheld Zelda game yet, and much, much more. Do they explain why Hyrule is no longer flooded? Well, they explain why the game is set on land, yes. Compared to Phantom Hourglass, which makes better use of the DS as a system? into the mic for Link’s Pan Pipes and the new whirlwhind weapon. Do any story details overlap with other Zeldas? Are there any new enemies? Yes, numerous, as well as some familiar standards. Any sidequests? If so, more than PH/WW? I’d say there are a similar amount to Phantom Hourglass. 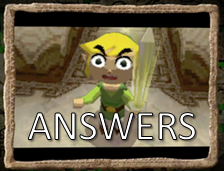 Is the game harder then Phantom Hourglass? opinion, but then I’ve been playing Zelda games for a long time. Are the controls the same as in Phantom Hourglass? Pretty much. There are few tweaks – it’s easier to do a forward roll for example. Can you customise your train? Later on in the game you can, but it’s not quite as significant element as it is in Phantom Hourglass. In Phantom Hourglass there were sea boss battles. Are there similar ones in Spirit Tracks? Yes, there are bosses you fight from the train. Is there a temple you have to return to once in a while like The Temple of the Ocean King on Phantom Hourglass. Does the Phantom join you in every dungeon, or just one? Phantom Zelda is always with you but is only playable in the Tower Of Spirits, with a few exceptions. Can you visit Castle Town? Yes you can wander around Castle Town. What’s the music like? Is it as good or better than the music Phantom Hourglass? Well, that’s a subjective question! I really liked it! Is it the best handheld Zelda? Is there as much train driving as there is sailing in Phantom Hourglass? I’d say roughly the same amount. Do you really activate the whirlwind item by blowing? That sounds pretty awkward! It didn’t bother me too much actually, but I can imagine that some fans won’t love it. How big is the game’s world compared to Phantom Hourglass’? Are there any returning characters besides Link and Zelda? Yes. You will heard about Niko from Wind Waker/Phantom Hourglass. There are others too but I can’t give them away yet. Is there treasure like the Goron Amber, Zora Scales, etc in Phantom Hourglass? Yes, there are loads of different pieces of treasure to collect. Does Link shrink in this game like in The Minish Cap? What is there to explore (in PH you sailed to an island and then explored it)? and unlock later in the game. Five, plus a few ‘mini dungeons’. Is there a postman? I loved the Twiliprin postman. Do you get to pull the whistle cord on the train whenever you want? Yup, you can yank away to your heart’s content. It’s actually a significant part of the gameplay at some points. Can you wear alternative coloured tunics or other costumes (besides Conductor) at any time in the game? No. You wear the red tunic for the first 45 minutes or so, then it’s the standard green tunic. Does the game feature any DSi enhancements? Any returning races? Any new ones? Yes, there are returning races, as well as some new ones. Again, no spoilers here! Are there heart pieces to find this time around? Yup, lots of heart pieces to collect. Would you say this game feels like a direct sequel to Phantom Hourglass? Absolutely, in both tone and feel. In Phantom Hourglass rupees weren’t much of a big deal. Will rupees in Spirit Tracks be more useful? treasures and items to choose from. Can you get off the train at any time? No, you can only get off the train at stations or when hailed by an NPC at the side of the track.